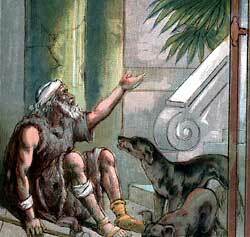 According to the parable that Jesus told, the beggar Lazarus sits at the gate of the rich man to ask for crumbs which might fall from the rich man's table. "A certain rich man," said Jesus, "hired a servant to take care of his goods. This servant came to live in the rich man's beautiful house and was called his stewards. He was supposed to handle the master's business wisely, but he did not. And after a while the master heard that the steward was wasting his goods. "Calling the unfaithful steward, the master told him what he had heard. And the steward hung his head in shame because he could not deny his guilt. Then the master grew angry and said, 'No longer shall you be my steward!' And he was about to dismiss the unfaithful servant. "Now, the steward had no other home in which to live, and he wondered what he should do. He thought he could not work in the fields like a poor man, and he was too proud to beg for food from door to door. So he decided to make friends with the other servants of the rich man that they might receive him into their homes to live. And he hurried to do this very thing. "By and by the master heard what the unfaithful steward was doing, and he said, 'After all, that man is careful to look out for himself. He shows much wisdom in this one thing.'" By this story Jesus wished to teach the people that they would not always have homes in this world, for some day they would have to go and live in another world. And just as the unfaithful steward had shown wisdom in preparing a home for himself for the time when he should no longer have a home in the rich man's house, so the people should begin to prepare for themselves a home in heaven by trying to please God. "There was a certain rich man who thought only of his own comfort and happiness. He wore expensive clothes, like a king's, and ate the best kind of food every day. His many servants were quick to do his bidding, and he did nothing except to live and enjoy himself. "And there was a certain beggar man name Lazarus, who had no home or friends. He was a good man although he was a beggar, and he came to sit at the gate of the rich man to ask for crumbs which might fall from the rich man's table. Finally the poor beggar became sick and sores broke out all over his body. He could not drag himself away from the rich man's gate. As he lay there suffering, stray dogs from the street came to like his sores. But the rich man did not try to help him at all; he let him lie there day after day in his misery. "By and by the poor beggar died, and when he died the angels came and carried him to heaven. No longer was he a poor beggar, for now he could rest in peace and happiness with faithful Abraham and with other good people who had left this world. And the rich man died, too, and his friends buried him in a nice, new grave, and perhaps they mourned greatly because he had been taken away from them. But that was not the end of the rich man, for after death he found himself in a place of torment. Now he was poor, so poor that he could not even get a drink of water to cool his burning tongue. "In this place of torment the poor rich man lifted up his eyes and saw, far, far away, the same Lazarus, who used to sit at his gate and beg. He remembered Lazarus, and now he saw him resting happily with Abraham in a beautiful place. The poor rich man called loudly to Abraham and cried for mercy. He knew he could not hope to rest with Abraham in that beautiful place, but he wanted Abraham to send Lazarus with just a drop of water to cool his burning tongue. "Now the poor rich man remembered his brothers who were yet living in the world. He did not want them to come to the place of torment, and he asked Abraham to send Lazarus back to the world to warn his brothers about that dreadful place. But Abraham said those brothers had God's law to warn them, and Lazarus need not go. Then the poor rich man pleaded that his brothers might listen if some one rose from the dead to tell them about the place of torment. But Abraham answered, 'If they will not heard the words in God's Book, neither will they listen if one should rise from the dead and speak to them.'" "One time there was a poor widow who had been wronged by a wicked enemy. She could not punish the enemy nor get back what he had taken from her, so she came to a judge who lived in her home city and told this judge about her troubles. The judge, too, was a wicked man, and he did not care to help the poor widow. For a while he paid no attention to her; but she kept coming and crying for him to help her. Finally he grew tired of her coming, so he said to himself, 'Though I am not a good man, yet I will punish this wicked enemy as the poor widow has asked me to do, lest she keep coming to me and troubling me from day to day.' So he punished the enemy." Then Jesus said, "Learn a lesson from this unjust judge. He granted the wish of the woman because she came often to him, and shall not God grant the wishes of those who call upon him day and night? For God is righteous, and he delights to do good to his people." In the multitude were some people who thought they were righteous, and they despised those whom they thought were not. Jesus taught them a lesson in the story-sermon about. "Two men went up to the temple to pray. One of them was a Pharisee, and the other was a publican. "But the publican stood in the corner by himself and would not even lift his eyes toward heaven when he prayed. He bowed his head and smote his breast, saying, 'God be merciful to me a sinner!'" And Jesus said, "I tell you, this publican, and not the proud Pharisee, went home to his house with God's blessing; for whoever lifts himself up in his own sight is not pleasing to God, but whoever humbles himself shall be lifted up."